Regular readers of this blog know that California Girl and I like our sparkling wine. 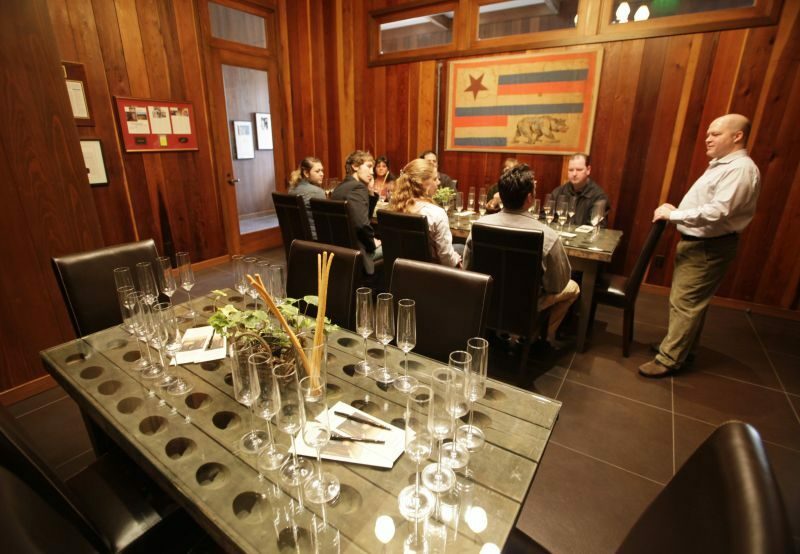 We have experienced tastings at Iron Horse, Domaine Carneros, Chapel Down, Keller Estate, Domaine Chandon, Gloria Ferrer, and Mumm. The last three were before the blog and so we have not written about them. It was, therefore, inevitable that we would visit Schramsberg; Napa Valley’s oldest sparkling winemaker. 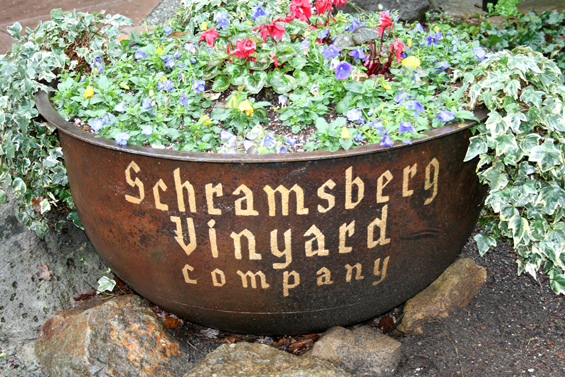 Schramsberg Vineyard is located off Highway 29. Unlike most of the wineries on this oft-traveled route, there is no impressive building visible from the road, nor even a gate to mark the entrance. We drove up a winding lane to park in a lot surrounded by a cluster of buildings. It was far from obvious which building held the visitor’s centre; so we wandered around like lost souls in the falling rain until we found a low sign hidden by a parked car. California Girl comments: It was really annoying that the signposting wasn’t great. I ended up popping my head into a building to ask office staff where we should be. They sighed like it was a question they get often. It was pouring rain and it didn’t help our mood to arrive drenched. 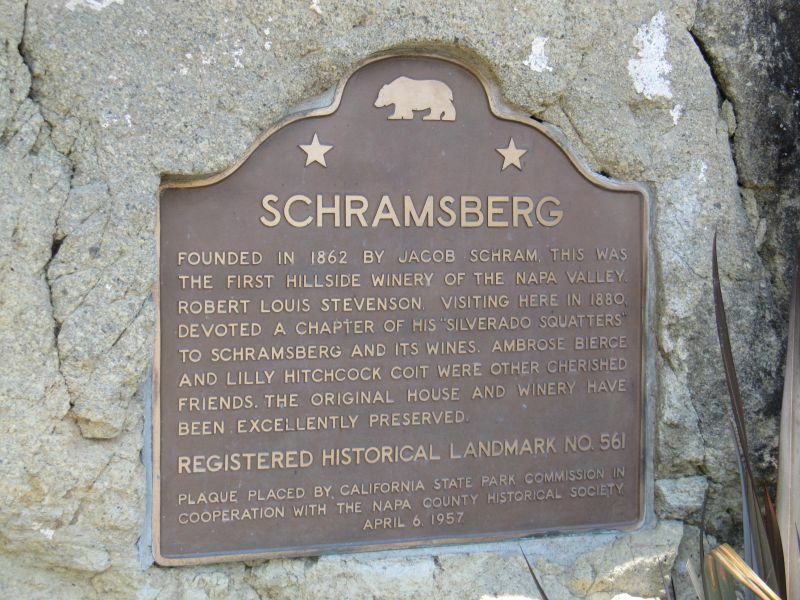 Schramsberg was one of the first wineries in Napa, founded in 1862, but fell into disrepair during the dark days of prohibition. It was purchased by the Davies family and restored to its original purpose as a source of wine in 1967; so it celebrates its fiftieth anniversary this year. 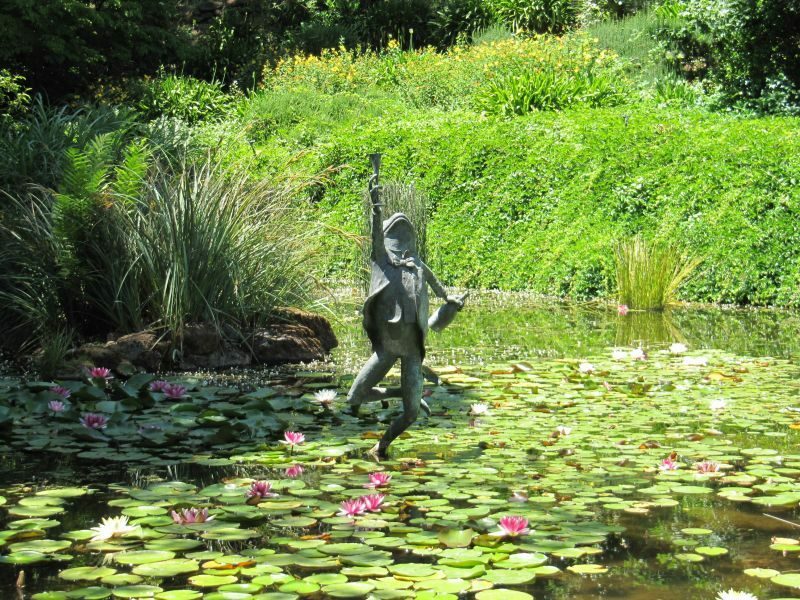 The Davies family remain owners of the business and live in a striking Victorian house on the grounds. California Girl comments: Boo for prohibition! Can you just imagine life without wine? No wonder why people looked so unhappy and stoic in old photographs! Yikes. 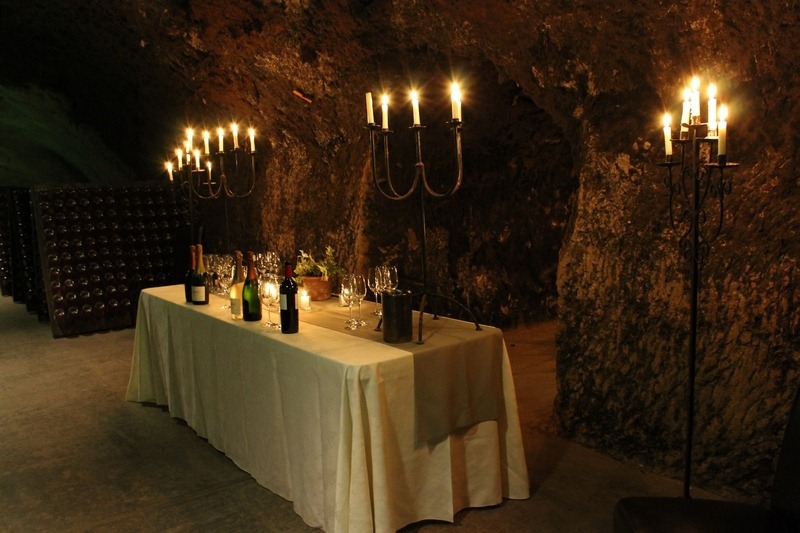 Before the tasting, we were taken on a tour of the wine caves. This network of tunnels that run into the hillside was started being built in 1875. It took eight-and-a-half years of backbreaking work with pick and shovel to create half-a-mile of tunnels. The caves now have storage for three million bottles in thirty-four thousand square feet of space. The tunnels keep a year round temperature of 56-58F (About 14C). On a cold February day, this made the tunnels feel almost blissfully warm. Our guide led us through the tunnels as he explained the process of making sparkling wine. Unlike the caves at Rutherford Hill, which we visited last year, these were low and narrow; making it impossible for a fork-lift to navigate; all of the movement of bottles and barrels has to be done by hand. California Girl comments: I enjoyed the wine cave tour and found learning about the winery and the operation interesting. I especially enjoyed the explanation of how hand-riddling works and why it is used (turning the wine bottles so that the sediment gets absorbed). Our tasting took place in the caves, with light provided by candles; great for atmosphere, less ideal for California Girl to take pictures. 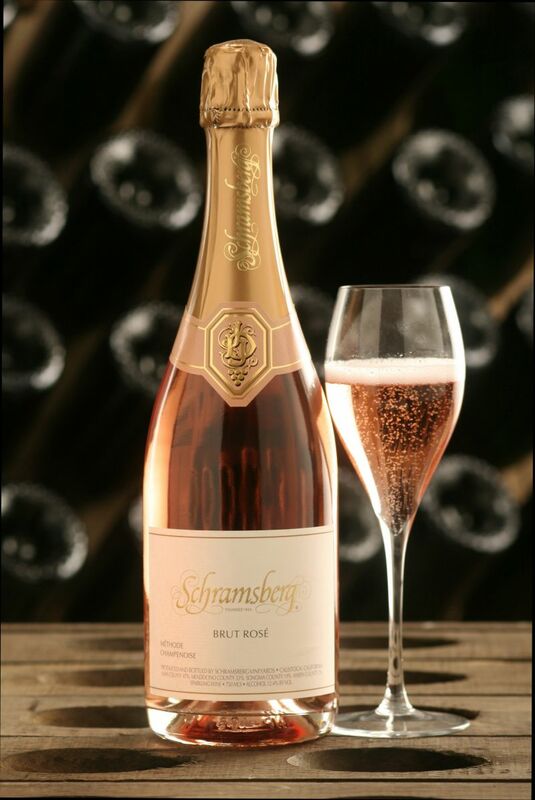 The first wine was 2008 J. Schramsberg, which is 82% Chardonnay and 18% Pinot Noir. The flavour was intense with yeast at the fore supported by citrus notes and a buttery finish. The bubbles were light. I was distinctly underwhelmed by this, given that it is their flag-ship wine. California Girl comments: I too was disappointed in the sharp, acidic/citrus flavor with the overwhelming yeast on the front of the palate. I felt that the wine was out of balance. Having said that, if I were to pair this wine with food, it would be with something sweet and creamy to contrast with the sharpness. Next up was the Blanc de Noir, which as the name suggests is mainly (88%) Pinot Noir. The nose offered honey and cinnamon. The taste was lighter and less intense that the previous wine, with hints of peach and a strong hoppy tang. The bubbles felt bigger. California Girl comments: I enjoyed this sip far more than the first. It felt like a far more balanced wine to me and I loved the fresh peach pie flavor. It was interesting, though, the minute I tasted it, I said beer. The finish reminded me of a beer as opposed to a sparkling wine. The third and last of the bubbly was the 2012 Rosé. This is made with 70% Pinot Noir. The nose offered yeast and berries. There was an intense acidity and dryness, with light bubbles. I preferred the Blanc de Noir, but would pick this over the J. Schramsberg. California Girl Comments: I agree with The Brit. (Ha, when does that happen?) This was my second favorite of the three. It was good but did not make me go WOW. Our final wine was the 2014 Anderson Valley Pinot Noir. This bore the Davies family label. The nose was a typical Pinot Noir with earthy notes and a subtle hint of fruit. Taking a sip, I was luxuriating in a soft blend of red currant, tobacco, and cumin. This was by far my favourite wine of the tasting. 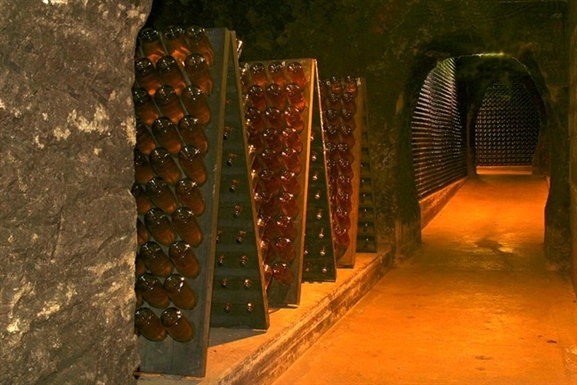 I know it is contrary to go to a winery to taste sparkling wine and then pick a still one to nominate as the best. This is the wine that we purchased. California Girl comments: I too liked the Pinot Noir out of our tasting. The fruits in the glass were round and smooth with lovely feel in the mouth. It didn’t have that distinct cherry pie flavor, but I really enjoyed it. I am looking forward to enjoying this bottle of wine with a meal of homemade coq au vin. 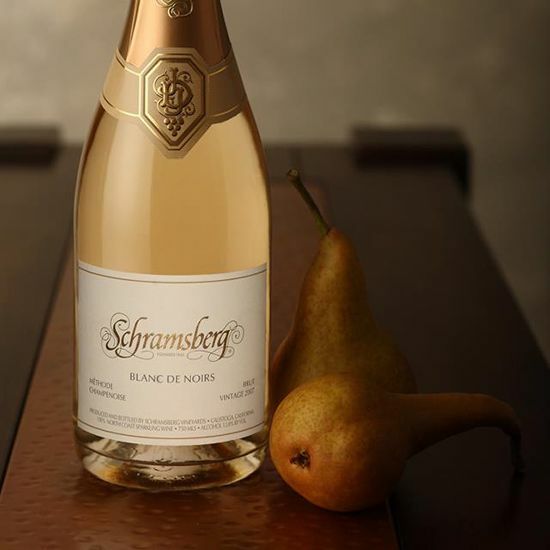 Reservations are required for tasting at Schramsberg and the winery is limited to a maximum of ninety-six guests a day. If you are looking for a sparkling wine tasting experience in Napa Valley, the wine, experience, and views are better at Domaine Carneros. California Girl comments: Sadly, I have to agree with The Brit and say that I was disappointed in the wines we were drinking. This winery will not go on our favorites list this year. But you know what? That is the thing, with each new vintage you get a whole different wine and it is always worth going to give it a try.